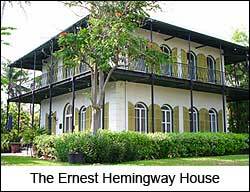 The Ernest Hemingway House was the residence of author Ernest Hemingway in Key West, Florida, United States. It is located at 907 Whitehead Street, near a prominent lighthouse close to the Southern coast of the island. On November 24, 1968, it was designated a U.S. National Historic Landmark.